This past weekend myself and a few close friends went on some short hikes. This was my third time out on the trail using the Black Diamond “Alpine Carbon Cork” trekking poles. I have been on the quest for some more durable four season hiking poles, so earlier this year I sent an email out to a few long distance hikers I know, most of them triple crowners, asking what they thought the best four season hiking poles presently on the market are. Much to my surprise all of them that responded said the same thing, these Black Diamond “Alpine Carbon Cork” trekking poles. After doing some further online research about these poles I decided to order myself a pair and see how they would work. I think it is important, from the very start, for me to say that it is just not fair to compare these hiking poles to the likes of the Gossamer Gear LT4 hiking poles or the Ruta Locura Carbon Fiber Yana Poles as neither of these poles are considered four season hiking poles. Yes they can, and have been used, within four seasons conditions but they are just not designed as four season hiking poles. In all ways the LT4’s and the Yana’s are night and day different in regards to weight and features. Where those two poles, and others in their weight categories, are all about getting hiking poles to be as light as possible, a pair of four season hiking poles are all about providing high shaft durability, easy to use while wearing gloves, and locking mechanisms that are at the very top end of locking systems. So by no means should this review be compared to my reviews of those other two sets of hiking poles. From the very beginning there were just a few things I wanted out of my poles. Features that would set them apart from my three season hiking poles, mentioned above. I wanted to go carbon fiber even though they are not as durable. The weight difference is significant enough that going with carbon fiber just made sense. I also wanted a locking mechanism that did not involve me standing around twisting two different shafts together in order to get them locked. Anybody that has used the twist-lock-locking-mechanisms knows that eventually, you are going to be standing there beating your head against the nearest tree because your hiking poles will not lock up exactly where you want them too. When it is winter, it is snowing, and there is a cold wind, the last thing you want to be doing is trying to get your hiking poles to lock in place. The #1 most important feature of a pair of four season hiking poles was having a locking system that was super easy, even with large winter gloves on. I also felt it was important that the hiking poles be friendly to use while wearing winter gloves. Both in having a slightly larger grip area and in being a bit less smooth then what my three season hiking poles have for grips. Lastly I wanted a three part design so that when I am not using the poles I can shove them into the side pockets of my backpack and not have them sticking up above the sides of the backpack. Collapsing down to just 25 inches, these poles are just under 5 inches shorter than the height of my winter time backpack. There is no doubt that the carbon fiber shafts on the BDACC’s are much thicker than my three season hiking poles. I almost feel I could beat them against a tree a bit and they would not break. I of course have not done so, and hopefully never will, but they do have a lot more heft to them than any other poles I have ever used. The main reason I chose the BDACC poles is because of their locking mechanism. Simply put, it is the most rock solid, easy to use, highly resistant to failure, locking systems that I have encounter on any hiking poles. This alone was the selling point when compared to other four season hiking poles. As for weight, the BDACC poles are some of the lightest heavy weight four season poles out there. Not the lightest, but far from the heaviest. 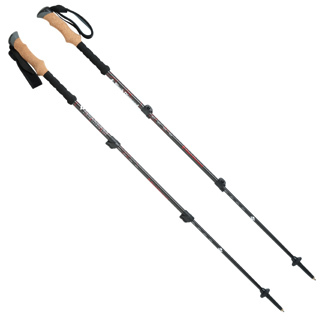 Yes, a pair of LT4’s together weigh less than just one of these poles, but I already addressed this issue above – these are four season hiking poles designed for a whole different level of hiking. Grips on the BDACC poles have both pleased me and annoyed me. I find the cork handles to be too tall. Even when wearing my largest pair of winter gloves it seems as if there is still a large amount of unnecessary cork in the handle area. At this point I am not all that impressed with the ‘Non-slip foam grip extension’. In fact, I would rather they just not be there. Even when pulling a hill they just seemed to be in the way. My hands did not naturally fit on them so I quickly stopped using them. On the positive side, up where your hands actually do grip these cork, I find the cork to be rock solid and provide a very good grip with zero slippage so far. Absolutely the best locking system of any hiking pole I have ever encountered. When you want them locked, just twist the little locker and bam, they are locked up solid and tight. To be honest, these are so amazing it could be very hard for me to go back to the twist-to-lock system such as what the LT4 and other poles have. Super tough carbon fiber shafts are impressing me big time. Yes they are heavier then non four season poles, but when you stop and consider the amount of folks that give the Gossamer Gear LT4 hiking poles a hard time (and I continue to mention the LT4 poles because they are the defacto ultralight hiking poles on the market) who complain that they have snapped the LT4 poles (usually by getting them wedges between rocks, roots or logs), I think a lot of these hikers would be surprised that a pair of carbon fiber poles exist that will very likely never have that happen. A nice middle ground on the weight aspects of four season hiking poles. Not really much else to say about this. I am glad they weigh as little as they do, but I do wish they were a bit lighter. Nicely padded wrist straps (I never use wrist straps exact in winter season) that when you have them on are very comfortable. Both with, and without, gloves. Highly impressed me. Three-shaft design so they collapse up very short (25 inches). For me this is a huge positive feature. I do not always hike with hiking poles. Having the ability to stow them awhile while not in use, or while in my truck getting to a trail head, or in a car if somebody is giving me a ride to town or back to the trail. There are a whole lot of times when hiking poles ‘get in the way’. Having hiking poles that can compress down to 25 inches is very nice! 492 grams (17.3 ounces) is pretty amazing giving their toughness, but it is still a bit heavier then what I would like them to be. Black Diamond could probably do some further work on the handles and the foam grip extensions and the wrist straps and probably get them down into the 15 ounce range, and that would make me very happy. The very top of the handle is a bit too large. I understand that it is larger than usual because it is a four season hiking pole, but the way that it is shaped makes it larger then it needs to be, and thus they consume more room inside of my side pocket then what they realistically should. Shave off a quarter inch from the top-front of the handle and that would also make me happy. Over branded. I realize a company wants to slap their labels all over their products, but these hiking poles are just over the top with branded stickers. One has to wonder how much additional weight is apart of these hiking poles just because of all the labels, stickers, and other label measurements that are on these poles. I really do not know any long distance hiker, or experienced hiker willing to spend the money on this level of a hiking pole, that needs to know exact height measurements of their poles. If you have not figured out where your poles should be at for use within your shelter and you are constantly forgetting, maybe these will help you out – but just about anybody that has been out on the trail for thirty or so days just instinctively knows what the height of their hiking poles needs to be when it comes time to set up their shelters. I mentioned above that the wrist straps are a positive feature, they are, however I think that the webbing used to connect them to the poles could have been smaller and less over built. This could be part of the four season design, but they still seem to be over built. Perhaps as time goes on I will understand the need for them being this way, but at this point, this is a negative for right now. In accordance of USA Federal Trade Commission 16 CFR, Part 255: I hereby declare that I am a “Trail Ambassador” of Gossamer Gear. The Gossamer Gear products mentioned within the content of this review were purchased by myself and were not supplied to me free of charge, or in exchange for services, by Gossamer Gear, unless otherwise mentioned. Any other product(s) mentioned within the content of this review is free of endorsement(s) between myself and the manufacturer(s) and meets all FTC 16 CFR.255 compliance requirements. Well John A. this is John C. (Bird Legs) from Sacramento and I guess great minds think alike. I just bought the Black Diamond Carbon Cork Trekking Poles on clearance at REI for $100 which is pretty good considering the list is $150. I noticed there were some nearly identical BD Carbon Cork Trekking poles at REI that were not on clearance. The only difference I could tell was a redesigned “Flicklock” mechanism on the poles that were not on clearance. The newer non-clearance Flicklocks were metallic and arguably “prettier” than the older black plastic ones, although beauty is in the eye of the beholder. All I know is the black plastic Flicklocks on my old metal BD poles worked fine, and never slipped once I got them dialed in. I think I’ve officially become addicted to your reviews. I consider them just about the best, most detailed articles I’ve ever found for UL/SUL hiking and beyond. I’ll be honest, I’ve recently purchased a couple of products you’ve recommended and made sure to give you and your blog credit when ordering them. I’ll even send you an e-mail detailing those purchases if you’re interested. I’m 31 and spent the first 15 years of my hiking life without poles. I trekked several thousand miles while visiting 35 countries on 4 continents. I think I mentioned that in a previous comment on another article. I learned the whole minimalism approach by necessity. However, after truly getting into the gear and culture of UL/SUL hiking (I average between a 4-8 pound BPW for 3-season use), I realized poles were a multi-use item in so many ways. This is the first year I’ve used them, so I’m no expert, but I did my homework and decided to purchase these exact poles. They have blown me away! I was turned off by the durability issues with GG poles, not that they aren’t an excellent product, just not for me. This is a tool I place all of my weight and trust upon when basically jogging downhill. I admit, I love what I call speed hiking and pushing myself down steep descents. I also enjoy pushing myself on iffy terrain on narrow, steep trails. That might be because of a trail-running background. I cannot constantly be concerned my poles will snap on me. No way. For this reason alone, I don’t mind carrying the extra weight in my hands. I like to think they pump up my puny biceps just a bit more as well. They also work great with my Gatewood Cape and Serenity innernet, which I’m still experimenting with on trail. When I venture off trail in thick chaparral that can shred clothes in thirty seconds, I use them to clear a path. And last but not least, not that I’ve ever needed them in this capacity, I feel they give me some way to fight off an animal attack. Some people might sticker, but having these poles in my hands is a lot better than nothing save my knife. When I lived in SoCal and hiked the Cleveland National Forest as my home base, mountain lion sightings were a common occurrence and I even spotted one myself. Also, many dog owners refused to keep their pets on a leash and more than once I came bounding around a corner to confront a barking pitbull. If an animal lunges at me, at least maybe I can hit it hard enough to make it eat the next hiker:) I’m kidding a bit there. Unless they have no trail etiquette. Then good riddance. In closing, I now use these exact BD trekking poles on all my hikes, even dayhikes. The locking mechanism has never failed me. The handles and wrist straps are comfortable. I love the easy adjustments compared to my GF’s Leki poles. As you stated, I can collapse them and fit them easily in my truck or GF’s car. Really, this is one of the few products I rave about to others. Hiking is such a personal experience and we all have gear preferences, but these poles can suit anybody from heavy haulers to SULers. Thanks again for another great review and happy trails! I really want these poles!! They are some amazing 4-season poles! The best part about these poles is the feel of them. I switched poles with my hiking partner recently and his aluminum poles lack the tuned shock absorption inherent to carbon fiber. I’m willing to carry the extra weight in this situation. They are that good.